This example shows how to set up and solve a mixed-integer linear programming problem. The problem is to find the optimal production and distribution levels among a set of factories, warehouses, and sales outlets. 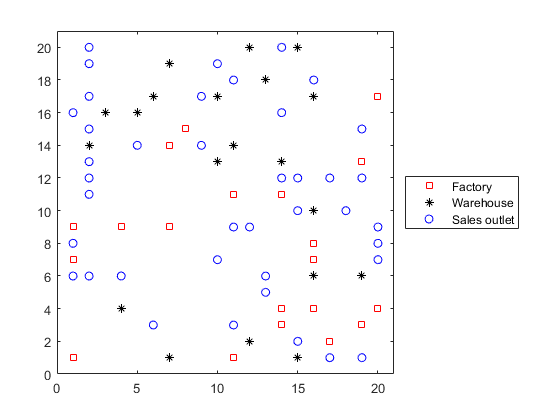 For the solver-based approach, see Factory, Warehouse, Sales Allocation Model: Solver-Based. The example first generates random locations for factories, warehouses, and sales outlets. 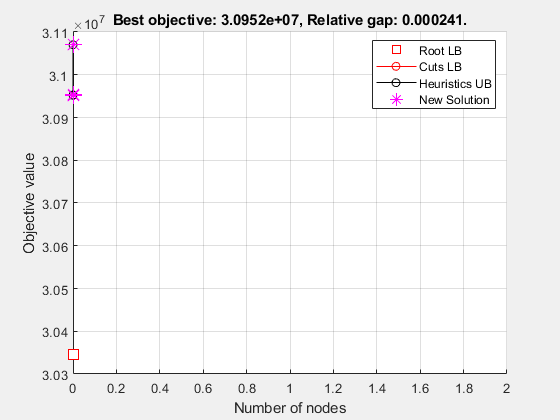 Feel free to modify the scaling parameter N, which scales both the size of the grid in which the production and distribution facilities reside, but also scales the number of these facilities so that the density of facilities of each type per grid area is independent of N.
These facilities are on separate integer grid points between 1 and N in the x and y directions. In order that the facilities have separate locations, you require that f+w+s≤1. In this example, take N=20, f=0.05, w=0.05, and s=0.1. There are P products made by the factories. Take P=20. The demand for each product p in a sales outlet s is d(s,p). The demand is the quantity that can be sold in a time interval. One constraint on the model is that the demand is met, meaning the system produces and distributes exactly the quantities in the demand. There are capacity constraints on each factory and each warehouse. The production of product p at factory f is less than pcap(f,p). The capacity of warehouse w is wcap(w). The amount of product p that can be transported from warehouse w to a sales outlet in the time interval is less than turn(p)*wcap(w), where turn(p) is the turnover rate of product p.
Suppose that each sales outlet receives its supplies from just one warehouse. Part of the problem is to determine the cheapest mapping of sales outlets to warehouses. The distance in this example is the grid distance, also known as the L1 distance. It is the sum of the absolute difference in x coordinates and y coordinates. The cost of making a unit of product p in factory f is pcost(f,p). These quantities must ensure that demand is satisfied and total cost is minimized. Also, each sales outlet is required to receive all its products from exactly one warehouse. ∑wy(s,w)=1 (each sales outlet associates to one warehouse). The variables x and y appear in the objective and constraint functions linearly. Because y is restricted to integer values, the problem is a mixed-integer linear program (MILP). Set the values of the N, f, w, and s parameters, and generate the facility locations. N = 20; % N from 10 to 30 seems to work. Choose large values with caution. Of course, it is not realistic to take random locations for facilities. This example is intended to show solution techniques, not how to generate good facility locations. Plot the facilities. Facilities 1 through F are factories, F+1 through F+W are warehouses, and F+W+1 through F+W+S are sales outlets. Generate random production costs, capacities, turnover rates, and demands. These random demands and capacities can lead to infeasible problems. In other words, sometimes the demand exceeds the production and warehouse capacity constraints. If you alter some parameters and get an infeasible problem, during solution you will get an exitflag of -2. To begin specifying the problem, generate the distance arrays distfw(i,j) and distsw(i,j). Create variables for the optimization problem. x represents the production, a continuous variable, with dimension P-by-F-by-W. y represents the binary allocation of sales outlet to warehouse, an S-by-W variable. Now create the constraints. The first constraint is a capacity constraint on production. The next constraint is that the demand is met at each sales outlet. There is a capacity constraint at each warehouse. Finally, there is a requirement that each sales outlet connects to exactly one warehouse. The objective function has three parts. The first part is the sum of the production costs. The second part is the sum of the transportation costs from factories to warehouses. The third part is the sum of the transportation costs from warehouses to sales outlets. The objective function to minimize is the sum of the three parts. Include the constraints in the problem. Turn off iterative display so that you don't get hundreds of lines of output. Include a plot function to monitor the solution progress. Call the solver to find the solution. Examine the exit flag and the infeasibility of the solution. Round the y portion of the solution to be exactly integer-valued. To understand why these variables might not be exactly integers, see the documentation. How many sales outlets are associated with each warehouse? Notice that, in this case, some warehouses have 0 associated outlets, meaning the warehouses are not in use in the optimal solution. 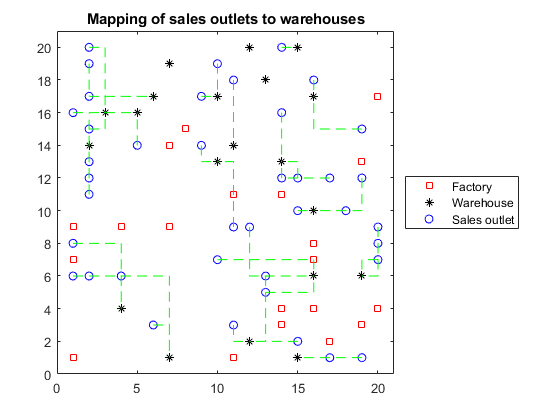 Plot the connection between each sales outlet and its warehouse. The black * with no green lines represent the unused warehouses.